Mangaluru, Dec 09, 2015: The ambitious project of the rejuvenation of Gujjarakere has come to a standstill and nearly Rs 3.5 crore, spent on the reviving work of the lake, has gone down the drain as the sole purpose of the project has failed. Mangaluru : The sewage from the drainage system continues to flow into the Gujjarakere and the Mangaluru City Corporation has failed to stop the flow into the water body. As a result, weeds have come up on the lake, covering the water surface completely. The ambitious project of the rejuvenation of Gujjarakere has come to a standstill and nearly Rs 3.5 crore, spent on the reviving work of the lake, has gone down the drain as the sole purpose of the project has failed. A media release by Gujjarakere Theertha Samrakshana Vedike, which has been working consistently for the conservation of the lake since 2001, Rs 1.99 crore has been spent by the Mangaluru City Corporation for the rejuvenation of the lake, between 2008 and 2010. Again, Rs 25 lakh was used for the underground drainage system in the locality, in 2011. This year 2015, the Department of Minor Irrigation had released Rs one crore towards the desilting and dredging work. But, the entire project has been an utter failure as the sewage from the underground drains in the area continues to flow into the tank, further polluting it and creating a nuisance to the residents surrounding it. Weeds have developed on the water body again. Works on laying of interlock around the lake and planting of saplings on the banks of water body, have not been taken up. Though the elected representatives and officials concerned have been informed of the same, there has been no favourable response. Spread across 3.43 acre - of which about 10 cent is alleged to have been encroached - Gujjarakere was a source of drinking water in the earlier days and associated with the religious ceremonies of the nearby Mangaladevi Temple and Marigudi Temple. Unfortunately, the promise by the elected representatives to revive the lake before the annual fair of the Mangaladevi and the Marigudi temples, has not been fulfilled. The Deepotsava of Mangaladevi Temple was on December 4. During the Car festival, the car passes near the lake and proceeds towards ’Gujjarakere katte’, a pedestal near the lake where the procession idol of the presiding deity will be worshipped. During his visit to Gujjarakere lake on May 30 this year, Mangaluru South legislator J R Lobo had conducted a review of the work and also directed the officials concerned to ensure that the lake is not polluted by sewage further. Accordingly, Corporation Engineer Anil had said that the UGD pipeline will be reconstructed to stop leakage of sewage from manholes. Gujjarkere spreads over 3.43 acre land in survey number 721/1. It is said that the water body has a history of 1,800 years. 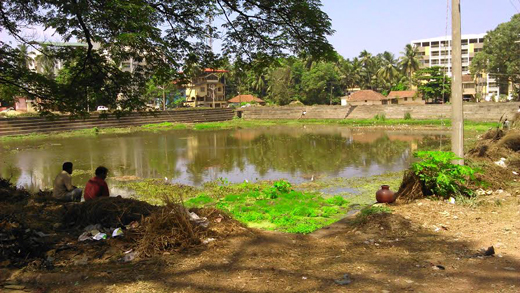 It is believed that Natha cult seer Gorakshanatha had built the water body for his Guru Matsyendranatha. It was called as Gurujanarakere and eventually named as Gujjarakere.